You may have heard of the Newbery and Caldecott Medals for children's literature, but did you know there are similar awards for young adult literature? As part of the Youth Media Awards from the American Library Association, over 20 awards and even more honors are handed out to books, authors, and other media for youth ages 0-18 every year. The most prestigious award for young adult books is the Michael L. Printz Award, which honors a book that exemplifies literary excellence in young adult literature. A select group of librarians reads a staggering amount of books published throughout the calendar year to select one award winner and up to four honor books. 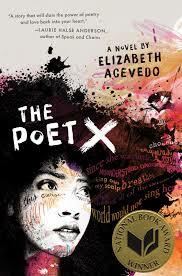 This year's winner is The Poet X by Elizabeth Acevedo, a coming-of-age story about a Dominican-American teen in New York City. The YALSA Award for Excellence in Nonfiction for Young Adults honors the best nonfiction book published each year for young adults. Librarians select five books as finalists in December, then choose a winner to be presented at the awards in the following year. The Unwanted: Stories of the Syrian Refugees written and illustrated by Don Brown won this year's award. To recognize up and coming authors, the William C. Morris YA Debut Award, first awarded in 2009, honors a debut book published by a first-time author writing for teens. This award celebrates both teen appeal and literary quality and is a great way to discover lesser-known books. This year's winner is Darius the Great Is Not Okay by Adib Khorram, which is about a teen boy exploring his heritage and finding love in Iran. On the flipside of debut authors is the Margaret A. Edwards Award, which recognizes an author for significant and lasting contribution to young adult literature. If you're new to reading YA, these authors are great to explore to see what are considered essential YA books. This year's award went to M.T. Anderson for Feed, The Astonishing Life of Octavian Nothing, Traitor to the Nation, Volume I: The Pox Party, and The Astonishing Life of Octavian Nothing, Traitor to the Nation, Volume II: The Kingdom on the Waves. The Coretta Scott King Book Awards for outstanding African American authors and illustrators don't always honor books for teens, but this year there were a few honorees among the bunch. Claire Hartfield won the author award for A Few Red Drops: The Chicago Race Riot of 1919 and Tiffany D. Jackson won the Coretta Scott King/John Steptoe Award for New Talent for her book Monday’s Not Coming. The Pura Belpré Awards honor Latino/Latina writers and illustrators whose work best portrays, affirms, and celebrates the Latino cultural experience in books for children and youth. Among this year's honorees were The Poet X by Elizabeth Acevedo, which won the author award, and They Call Me Güero: A Border Kid’s Poems by David Bowles, which won an author honor. The Asian/Pacific American Award for Young Adult Literature honors books that celebrate Asian/Pacific American culture and heritage based on their literary and artistic merit. The librarian committee selected Darius the Great Is Not Okay by Adib Khorram as this year’s winner. The Sydney Taylor Book Award is presented annually to outstanding books for children and teens that authentically portray the Jewish experience. Vesper Stamper, author of What the Night Sings, is the 2019 winner of the award for teen readers. The Schneider Family Book Award honors books that embody an artistic expression of the disability experience for child and adolescent audiences. This year's award for teen books went to Anger Is a Gift written by Mark Oshiro for his portrayal of a teen who experiences panic attacks. The Stonewall Book Award honors works of exceptional merit for children or teens relating to the gay, lesbian, bisexual, and transgender experience. The award committee selects winners for children and young adults, as well as several honor books. This year's award for teen fiction went to Hurricane Child by Kheryn Callender. The Odyssey Award honors the best audiobook produced for children and/or young adults in the previous year. A book can be wonderful, but not translate well to audio, so these awards are a way to find the best of them. This year's award went to Sadie by Courtney Summers and narrated by Rebecca Soler, Fred Berman, Dan Bittner, Gabra Zackman, and more.